The only acceptable modes of payment are demand draft or pay order. Please note that all bank charges and fees are paid by the customer. Mention your name, Project Name, Registration number, Amount, Installment Number, Property Details (Plot Size, Plot Category / House Number etc) on the inverse of the payment instrument. Here are the details for Telegraphic Transfer in USD, GDP or EUORS. Installment payment can be deposited in US Dollar or equivalent (Pound/Euro) using the prevailing foreign exchange rate. In-case of telegraphic transfer; attach the SWIFT copy of the payment transferred along with the duly filled form. The customer will pay all bank charges including NOSTRO charges. Please input the correct Project name, Unit booked, Name of the applicant and Contact number of the applicant on the payment-transfer form. Get Bahria Town Karachi Latest News on Your WhatsApp! i have 250 yds plot No 1330 in placenta 6, i want to know how many installments have been paid. further i want to know how I can pay my dues direct to the Bank, and what is the contact telephone number for inquiry. I) how & when can I start construction on my plot. If Bahria Town will provide me the layout plan for construction, ground + 1 floor can be made? III) or how much cost I have to pay If Bahria will do the construction? AoA. 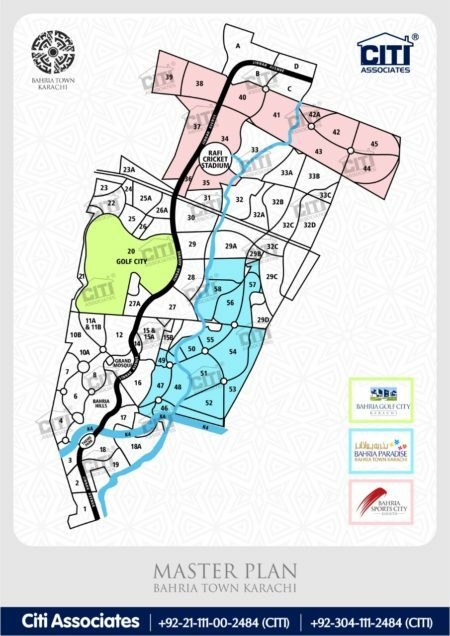 When will map of BTK precinct 32 available on your site? It is simply a nightmare for overseas Pakistanis to make instalment payments from overseas. In today’s modern banking world, BTKP has done nothing to make the life easy for overseas Pakistanis to be able to make direct payments to BTKP. Trusting anyone in Pakistan with your money in their hands is like fooling yourself. My biggest mistake in life has been the investment I made from overseas in BTKP and BT Islamabad. Same issue I’m facing I don’t know how to pay my installments for Bahria town Karachi plot I’m so confuse with this issue any solution you found ? If yes please share with me your experience Thanks . same problem here. I’m also looking for solution. 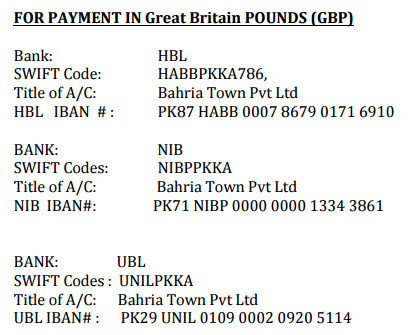 Chase bank wire transfer is requiring recipient address of bahria town pvt ltd karachi. Its no where to be found. I am stuck at this step and can’t send my payment. i MUHAMMAD AMIN CNIC NO. 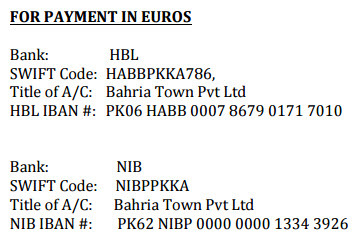 42401-4127728-9, haVe plot=179, LOOP ROAD IN PRECENT-25 , WITH REGISTRATION BTKP-QUS2752 IN BAHRIA TOWN KARACHI; I AM REGULARLY PAYING INSTALLEMENT. PLS PROVIDE LATEST STATES OF DEPOSITED MONEY AGAINST SAID PLOT. Latest price list of full payment as well installments. Which precincts are still on installments with down payment details please. I am inquiring about 200 SQ. YARDS homes would you please kindly send me booking and installment methed I in America I would like to pay in US $ which bank I should make payments. It is very difficult for overseas investor to pay instalments. I live in Canada, so even if I sign and send scanned copy of challan to someone in Pakistan to pay, the banks do not accept scanned copies. Please do something Bahria! You are absolutely right and really it causes huge headache. Can you please put the payment method of the website for USA folks? I see the address posted, but is regular check acceptable? Is there any information that should be submitted with the payment? 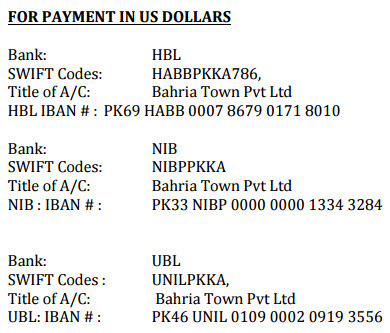 I want to know if payment in US dollars cash is accepted by Bahria Town Karachi for a plot I have in Golf city overseas block . I have an overseas commercial file of 125sqf. Isince 2014. 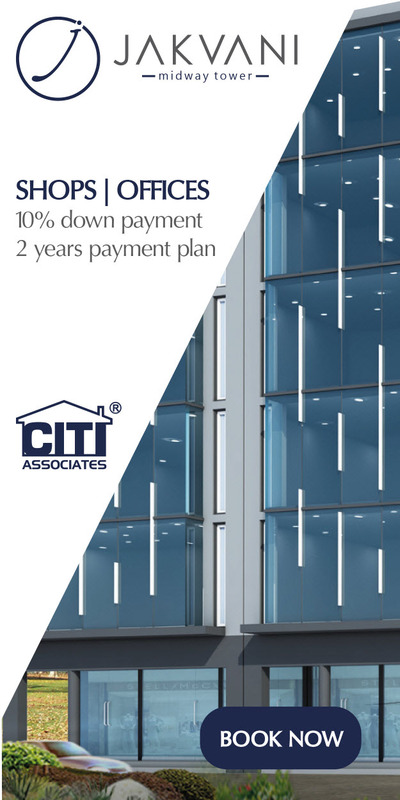 I am paying installment of $6550/- quarterly for last 4 years regularly. Paid 16 installments till now. But donot know plot number. ??? And where it is or in which precinent is it ???? What should I do. Please reply.